Hatters interim boss Mick Harford has been heavily praised for the manner in which he has kept the team ticking over since Nathan Jones left the club. The Luton legend was placed in temporary charge after Jones quit to take over at Stoke City, picking up a superb 1-1 draw at Sunderland in his first game in charge. 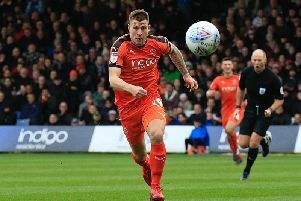 He then saw Town go toe-to-toe with Championship opponents Sheffield Wednesday, falling to a narrow 1-0 defeat on Tuesday night, as club captain Alan Sheehan said: “Mick has come in, all the boys, we love him here. “We’ve got unbelievable respect, he’s a legend at the club, he’s come in to take the reins, as you could see from our performance on Saturday, not a lot has changed really. “He is a legend at the club. Even when Nathan Jones was here, Mick Harford played a huge part. “He was in and around us all the time, telling stories, all the boys love him, we’ve got so much respect for him. “If there was a right man in to come in after the three guys left to go to Stoke, it was Mick Harford, because we would run through a brick wall for him really. That was a view echoed by striker James Collins, who said: “He’s a hero here with the fans, he’s a hero with the lads as well. “He comes in every day, when the gaffer was here, he gets around the boys, we have a coffee and a chat, and he’s just like one of the boys. “We’ve all got huge respect for him, as you can see out there, we all played for him, ourselves and the fans. “Credit to him and his staff, they haven’t changed much, because what we did have with the gaffer here was good and it was going well, so why change anything? While defender Sonny Bradley said: “It's natural for Mick, he's been there, done it before. "He said he hasn’t taken sessions for years, so was new to it, but Mick’s part of our team. "He knows all the boys, all the boys fully respect him, he’s in every single day, the transition has been quite natural to be honest. "He’s just said in the dressing room, how proud he is of us for today’s performance, but I think we’re all thinking the same thing, we’re proud of Mick, and can only thank him for stepping up and taking charge." Meanwhile, Luke Berry also enthused about the impact that Harford has had, adding: "He’s been brilliant, he's come in and given us all a belief to play and keep doing what we’re doing. "If he wanted to (carry on until the end of the season) it would be great, because every single one of us respects him and wants to do our utmost to get this club promoted for him. “That’s up to Gary (Sweet, chief executive) and all the other people who are in charge of that though, so it’s not for me to say really."